Top 4 Exercises to Rehab a Knee Injury | Podiatry Associates, P.C. It doesn’t take much to get into running. 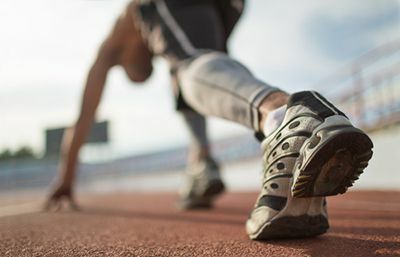 You don’t need any fancy memberships or expensive equipment to start—just a good pair of shoes and willingness to put in the time and effort to run well. You do, however, have to be careful. Although the sport is generally good exercise, it also puts a lot of strain on your joints, particularly your knees. Developing a knee injury is unfortunately common. Aching knees don’t have to mean the end of your jogs, though. The right care and rehab can make a significant difference for your comfort and ability to run well once you recover. Physical therapy exercises to strengthen your knee joints may be just what you need to alleviate pain and improve your running. Stronger supporting muscles and connective tissues help decrease the stress on your knee, alleviating discomfort. Stabilizing your knee can also make it less likely you’ll re-injure yourself. Half-Squats – Stand with your feet apart. Bend both knees so you start to squat, but keep your back perfectly straight. Lower roughly ten inches, then hold for ten seconds. Relax and repeat. Hamstring Curls – Stand holding a chair for balance. Keeping your thigh completely still, bend one leg at the knee so that foot lifts behind you. Hold it for a few seconds, then lower and repeat. Leg Extensions – Sit in a chair with your feet flat on the floor. Holding your thigh still, straighten one leg at the knee so your foot lifts up in front of you. Lower and repeat. Standing Quad Stretch – Hold a chair for balance. Bend one knee and grab your ankle. Gently pull your heel toward your body while your knee points toward the ground. Remember to still take it slow as you get back into your running routine. Don’t push yourself before your knee is ready, or you might reinjure your joint despite your rehabilitation. Let our team of experts at Castle Pines Physical Therapy help you establish a recovery plan and monitor your progress, so you get back to the trails safely and pain-free. Call (303) 805-5156 to make an appointment with our office in Castle Pines, CO.